Behind-the-scenes look at U2's stage for the 360 Degree tour. 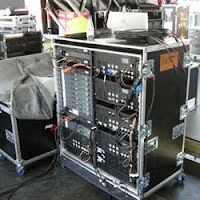 A Behind the scenes look at the London show and comments from the U2 360 Tour. Jake Berry, Production Director Said “The band's reaction upon seeing the stage for the first time was like Wow. Every show, every production has a wow factor. Our show just lasts a little longer than anybody else's. They were just amazed. Everything they thought it could have been the whole idea from Mark (Fischer) and Willie Williams the set designer and the show designer, the whole concept was to make something big enough so the whole stage would be intimate. And believe it or not the larger the show was, the more intimate the show looked. So it's accomplished all those goals." Willie Williams had this to say "It's a very interesting dynamic when we all sit round a table and talk about things because what's unusual about U2 is they really are a group. There are four of them and they all have their input. And in the live show, Bono does really has more of an input because, at the end of the day, he's the one that has to pull it off. He can't turn around and fiddle with his amplifier when something's going wrong. But they all have the power of veto and they're all involved and they all come up with ideas. It's a wonderfully collaborative process." A name we have not heard from Arthur Fogel, CEO of Global Touring and chair of Live Music for Live Nation had this to say "Certainly with respect to U2, there really are no masters of performing live. It's a privilege to be able to work with them. They're really an inspiration to a lot of artists to keep pushing the envelope to develop shows that excite people and that are really what live shows are all about." Mark Fischer, Architect had a comment as well, "It's something you can't replicate in your living room or on your Ipod. And in the digital world, you need to know why you're going to bother to shell out a hundred and odd pounds for you and your lover to come see and this thing rather than stay at home and that's what we're in the business of doing. So it's memory, you'll remember this. Anyone who comes to this show, in 20 years time will say 'Remember when you were at Wembley, when you saw U2, 360degrees? It was amazing.'" Crew News: Production workers, lighting and sound technicians and video production staff were busy with the final preparations ahead of the Irish rockers "360 Degree" shows on Friday (August 14) and Saturday (August 15) at the Wembley Stadium. The whole stage comes in three parts. First, comprises of covering the entire pitch with flooring which enables them to drive cranes and trucks onto the field. The second part takes four days to build the steel structure and the last day composes of testing the lights, sound, video equipment, sound check and any last minute changes. Taking down the entire production takes approximately two days. Supporting acts for the London shows will be Mercury Prize winning band Elbow on Friday and Mercury Prize nominated Scottish rockers Glasvegas. U2 will continue to tour Europe until the end of August and move onto the United States and Canada in September.